Following the well supported ‘Beating the Bounds’ walk on Rogation Sunday 2009, CREWalkers was set up. The aim was to organise monthly walks for residents of Crondall & Ewshot, who would like to walk with a friendly group on a regular basis. Our first walk was on 15th October 2009 and we are now into our ninth year of regular walks. 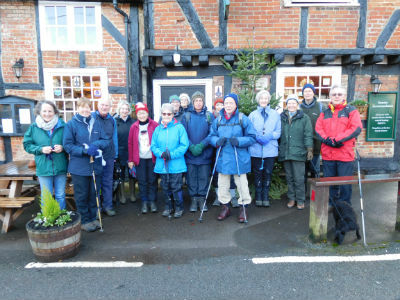 These take place on the second Thursday of each month and over the years we have set off from 35 different locations, usually fairly local although we have been as far as Sutton Abinger and Itchen Abbas. The walks are circular, about 5 miles long and start at 10.00 am from pubs in the area and we aim to be back in time for an optional lunch and a chat. Many of us have been surprised at just how much varied and open countryside there is so close to our villages. We had our regular Christmas Lunch at The Plume of Feathers on 14th December. There were 25 members, including spouses/partners for the lunch and 15 members on the walk beforehand. It was a lovely day for walking around Crondall and the highlight was the view from the top of Horsedown Hill, which we climbed after obtaining permission from Mr Saunders.